In court this week, Risen complied with a subpoena and testified in federal court. He testified that he would not reveal his sources. Well done. Here’s why what he is doing is so important: Unless reporters find out secrets, they are not really doing their job. Without those stories, we would have next to no idea what our government is doing. Mr. Risen, in the speech last fall at Colby College, noted that many of the most controversial aspects of the government’s response to the Sept. 11 terrorist attacks — drones, waterboarding, secret prisons, prison abuses in Iraq and more — took place in secret. “If you took away all the things that the press revealed to begin with in the war on terror, you would know virtually nothing about the history of the last 13 years,” he said. He said that the government was less likely to prosecute leaks of classified information that made the government look good, such as the successful mission to kill Osama bin Laden. SCOTUS: If you make journalists criminals, then only criminals can be journalists. It’s no surprise, I suppose, that the U.S. Supreme Court has rejected an appeal from a New York Times reporter who has been seeking to avoid being sent to jail for his refusal to testify about his sources. The ruling is a setback for reporter James Risen and for the entire enterprise of journalism as well. The reason: the high court cannot find protection for reporters in the U.S. Constitution. Many people disagree. They invoke the ancient legal doctrine which holds that justice demands every person’s testimony — no exceptions (oh, except for the “testimonial privilege” widely granted to clergy, attorneys, spouses and others — plenty of people enjoy the right not to testify with no deleterious effects on society). Superficially, this makes a certain amount of sense. But it overlooks the chilling effect on both sources and reporters if journalists can be dragged into court and ordered, under oath, to break their word and reveal the identities of their confidential sources. The fully predictable result of this doctrine will be that the people will not learn all that they might about difficult, hidden truths. And a word here about criminal justice. Obviously, the investigation, prosecution, and punishment of crime is an important value in society. I would not want to live in a society that did not suppress crime. But we must bear in mind that law enforcement is not a transcendent value; it is not so important that it can be used to sweep away all other rights and values. It has to be balanced against other important priorities (like being secure in our persons and papers). I maintain that it is better for a handful of prosecutors to miss out on the testimony of a handful of people than it is to impose blinders on the press. I don’t want to live in that kind of society, either. Prosecutors pursue justice; journalists pursue truth. Those are both important, and sometimes allied, enterprises. But they are not identical, and when they conflict, my default position would be to privilege truth-seeking. Also, bear in mind: prosecutors have plenty of techniques and powers that journalists don’t have. –They have the power to subpoena (non-journalist) witnesses and question them under oath. –If witnesses lie, prosecutors can charge them with perjury. –Prosecutors have the power to induce suspects to talk by negotiating plea-bargains. –Prosecutors have the home-team advantage in every courtroom in the country. –Prosecutors have the power to get a search warrant and spy on suspects. If prosecutors can’t solve a particular crime with all those powers (which journalists don’t have), then maybe they’re just not trying hard enough. One implication of today’s Supreme Court ruling: until there is a new array of justices on the high court who properly understand the Constitution, I guess the only remedy is to support legislation (S. 987) to create a federal shield law for reporters. Incidentally, most states already have shield laws that protect journalists in state courts, and we have not suffered any terrible crime wave as a result. All those state AGs and DAs somehow manage to live with laws that uphold press freedom and balance it against the imperatives of law enforcement. As I like to tell my students: History keeps happening. The past is always with us, and here’s a case in point: the arrest of Irish leader Gerry Adams as a result of an oral history project carried out at Boston College by researchers who promised their interviewees that the contents would remain confidential. As my friend and fellow journalism professor Dan Kennedy points out, the prosecution of this case represents just part of the Obama administration’s campaign to undermine the rights of reporters (and now, researchers too). From today’s NYTimes, a good overview by Boston correspondent Kit Seelye. And more, from the Irish Independent and the Irish Times. Does James Risen need a “shield law”? The New York Times has an editorial worth reading today about one of its reporters, James Risen, who is facing a court order to reveal his confidential source for a book that he wrote in 2006. At issue is a ruling by the 4th U.S. Circuit Court of Appeals late last week that explains the whole case. The upshot: based on the Supreme Court’s erroneous ruling in the 1972 Branzburg case, the Circuit Court said the journalist has no choice: when the government demands to know who your source was, you have to spill the beans, or go to jail (and then spill the beans, I guess, unless the government plans to jail journalists for life). As I have argued here and here and here, SCOTUS got Branzburg wrong, so it is hardly surprising that its progeny are similarly wrong. In my view, the First Amendment, when properly understood, would provide journalists all the protection they need to protect their sources. Until that 1972 error is corrected, we will continue to see these kind of rulings, and journalists — regrettably — will have to go to jail. An egregious appeals court ruling on Friday has dealt a major setback to press freedoms by requiring the author of a 2006 book to testify in the criminal trial of a former Central Intelligence Agency official charged with leaking classified information. The ruling and the Justice Department’s misplaced zeal in subpoenaingJames Risen, the book’s author and a reporter for The Times, carry costs for robust journalism and government accountability that should alarm all Americans. A federal district judge, Leonie Brinkema, was mindful of those costs two years ago when she ruled that a qualified reporters’ privilege to protect confidential sources, grounded in the First Amendment, applies in criminal cases and declined to compel Mr. Risen to reveal a confidential source in the trial of Jeffrey Sterling, a former C.I.A. employee. The 2-to-1 ruling by the United States Court of Appeals for the Fourth Circuit, which overturned Judge Brinkema’s sound decision, relied on an overly sweeping reading of a murky 41-year-old Supreme Court decision that has been rejected by other federal appellate courts. The ruling also failed to respect the nearly universal consensus among states that there is a common law privilege for protection of reporters’ confidential sources. The third member of the panel, Judge Roger Gregory, got it right, calling his colleagues decision a real threat to investigative journalism. “Under the majority’s articulation of the reporter’s privilege, or lack thereof, absent a showing of bad faith by the government, a reporter can always be compelled against her will to reveal her confidential sources in a criminal trial,” Judge Gregory wrote in a forceful dissent. “The majority exalts the interests of the government while unduly trampling those of the press, and, in doing so, severely impinges on the press and the free flow of information in our society.” Judge Gregory found that the government has ample evidence to proceed with the prosecution without forcing a reporter to choose between protecting sources or going to jail. The precedent set here is especially troubling since the Fourth Circuit, where the ruling applies, includes Maryland and Virginia, home to most national security agencies. If left to stand, it could significantly chill investigative reporting, especially about national security issues. It was dismaying that the Justice Department issued a statement approving of the court’s wrongheaded legal conclusion barely a week after Attorney General Eric Holder Jr. announced new guidelines that are supposedly designed to better protect the news media from federal investigators in leak cases. But the department also said it was “examining the next steps in the prosecution of this case.” That should include withdrawing its demand that Mr. Risen testify about his sources. This issue tests the new guidelines and their promise not to threaten journalists with jail for doing their jobs, except in “extraordinary” circumstances. If he has any intention to live up to that pledge, Mr. Holder should reopen the question of Mr. Risen’s subpoena. One of the most serious recent threats to press freedom is playing out in Colorado. It involves a reporter for FoxNews.com who is the target of a subpoena by a state prosecutor who is pursuing the case against the suspect in the 2012 mass shooting in Aurora, Colo.
As so often happens, the judge in the case would also like to know the identity of the sources, so he is threatening to hold Winter in contempt of court unless she rats out her sources. That means the judge could send her to prison for up to six months, or until she relents and gives up the names. This is a classic case of prosecutorial and judicial abuse of power that threatens the public’s right to know. The Constitution’s First Amendment, which guarantees freedom of the press, exists for the benefit of the American people, not just the news business. The people have a right to know things, and it’s for that reason that government is restrained from interfering with news-gathering and news dissemination. In cases like this, a “shield law” could protect the reporter from such pressure and threats. But a proper reading of the Constitution could serve just as well. In the rare cases where the use of confidential sources gets to the point where jail time is a real threat, most jurisdictions require that prosecutors meet a multi-prong test: the material being sought must be germane to the case, and it must be unavailable in any other way. This case hardly meets either standard. In the criminal case against Holmes, the question for the jury will be, did he kill all those people? Whether he sent a notebook to anyone in advance is irrelevant. (It might be relevant if the survivors of the shooting ever brought a civil suit against the psychiatrist, charging the psychiatrist with failure to warn — but that’s another matter entirely. 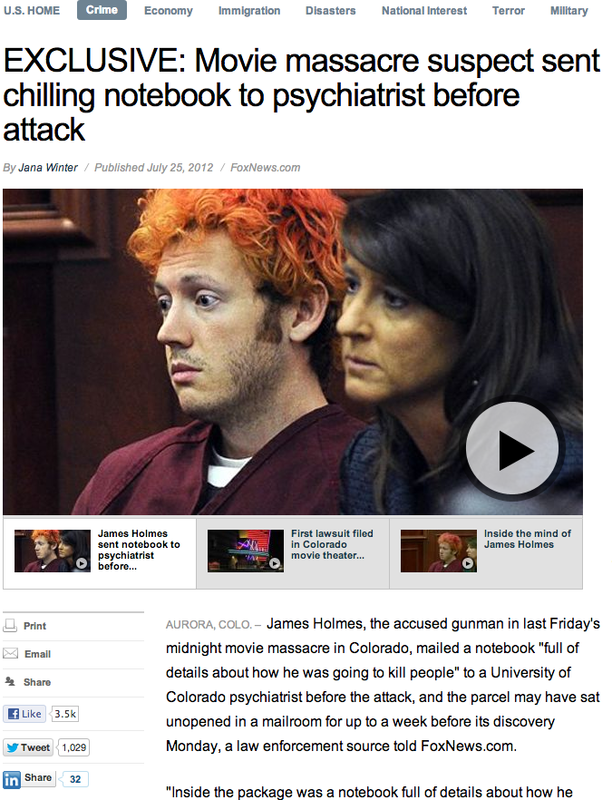 And even then, the notebook is probably irrelevant, since the psychiatrist did not even open the package it was in until after the shooting.) In the criminal case, finding out Winter’s sources serves no purpose, and the subpoena should be quashed. The judge is probably irked that Winter’s sources violated his gag order in the case, but he never should have issued a gag order in the first place. Of course, the suspect has rights under the same Constitution that protects the journalist. Holmes is entitled to a fair trial, which includes the right to face his accusers. But Winter’s sources are not his accusers and do not need to be dragged into this case. Holmes’ rights to a fair trial also include the right to be tried by an impartial jury — that is, one that is not inflamed by news reports about the case. But there again, the prosecutor and judge have no leg to stand on. Whether or not there was a notebook and whether Winter was told about it by this person or that person has no bearing on the state of mind of the jurors who will ultimately hear the case and decide Holmes’ fate. My suspicion is that the prosecutor and the judge just want to control all the parties in the case, and they are frustrated that they can’t do so. Recently, some people have complained that the liberal media have been slow to rally behind Winter because she works for the media empire of the despised conservative Rupert Murdoch. (According to the Times, she used to work for Murdoch’s New York Post before signing on as an investigative reporter for FoxNews.com, the website associated with Murdoch’s Fox News on cable television.) Today’s Times carried a news story and an op-ed about the case, so it hardly seems that the liberal Times is ignoring the case. Some folks at Fox News seem to have a problem with the Constitution, especially when it comes to extending its protections to unpopular causes. But the beauty of the Constitution is that it exists for all of us, without exceptions. So to my colleagues at Fox News, I say welcome to the experience of being a frightened individual, hunted by the powers that be, despised and alone, hoping against hope that some clause in a document drafted in 1789 can save you from unwarranted punishment. That’s why we have the Constitution, for everyone. According to a story in today’s NYTimes by Charlie Savage, just about every major U.S. news organization joined in urging a federal appeals court to “shield” the journalist, the indispensable James Risen, a Times reporter on national security issues who also wrote a book in 2006 called State of War. In his book, Risen, using confidential sources, embarrassed the CIA by detailing the agency’s failed attempts to sabotage the Iranian nuclear-weapons program. To my mind, that seems like valuable information that a free people ought to have access to, so that we can debate the wisdom of what it being done in other countries in our name. Without reporting like that done by Risen, we would all just be kept in the dark. The story in the Times has plenty of valuable links to the original documents, including the media’s amicus brief. Here is a link to the key Supreme Court ruling on the issue (and be sure to read down to Justice Douglas’s stirring dissent, which gets it right). For a fuller understanding of the historical backdrop of the case, here is an excerpt from my new book (due out in about a week) that details the U.S. Supreme Court’s handling of the landmark Branzburg case in 1972. 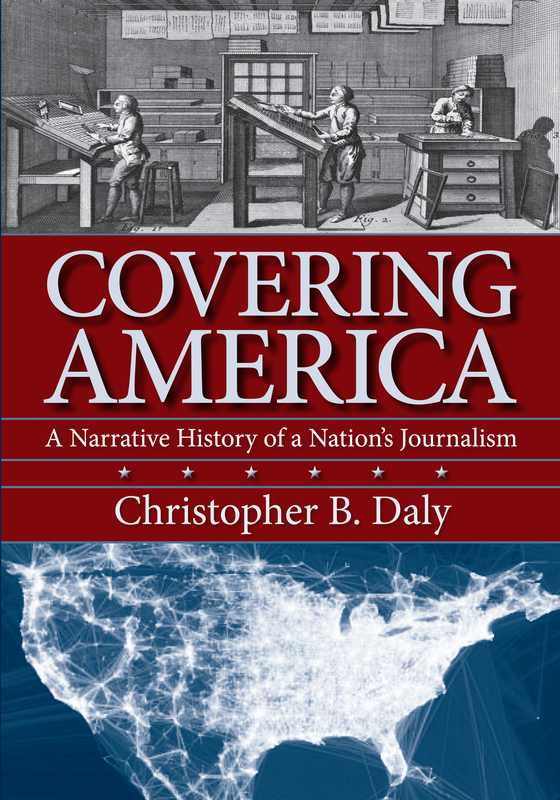 Branzburg v. Hayes was the case that has shaped the legal, political, and constitutional debate over whether journalists should have a “shield law” to allow them to protect confidential sources. King Jr. Caldwell was in the Lorraine Motel on April 4 when a loud shot rang out. chat with an associate. . . .
Caldwell returned to the “riot beat” for much of the summer (fig. 12.5). ability to protect confidential sources. fact that the Panthers were armed and that they were threatening to kill the president. prestigious San Francisco law firm to represent Caldwell. Their advice: cooperate. for the Louisville Courier-Journal who had been an eyewitness to a drug crime. before grand juries; like Caldwell, they had refused on professional grounds. respected journalists as Anthony Lukas, Walter Cronkite, and Marvin Kalb. granting certain categories of people a legal privilege against having to testify. the majority had the effect of denying journalists’ claims to a constitutional privilege. apart as a favored class, but to bring to fulfillment the public’s right to know. jeopardy ever since, at least in federal courts. Black Panthers. Most of Caldwell’s contacts were in jail, in exile, or dead. Meanwhile, by the late 1960s, more and more people. . .